Before we start discussing the functions of noun + noun modifiers, let’s do a little warm-up exercise here. Following are the three sentences. On the basis of the usage of modifier, identify which of the following are correct. James created a magnificent design by using latest graphic design tools, a work acknowledged and appreciated by all investors. James created a magnificent design by using latest graphic design tools, an experiment that many feared to do because of the instability in the output resulting from these tools. James created a magnificent design by using latest graphic design tools, expensive but super helpful devices developed especially for minute detailing and elaboration. All the above mentioned “warm up” sentences are correct. Well, I would not be surprised to know that the answer surprised you. The modifier that all three sentences have here follows the structure of noun + noun modifier. The usage of this modifier in all the above-mentioned sentences is correct. Noun + Noun modifiers are very versatile modifiers. 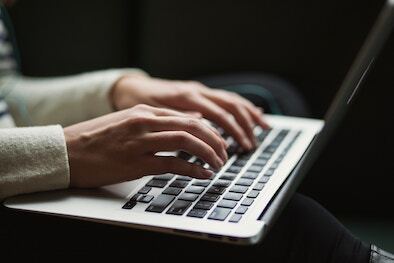 Their structure does not restrict their modification to a particular entity in the sentence like other modifiers such as verb-ed or verb-ing modifier without a preceding comma that can only refer to the preceding noun entity. 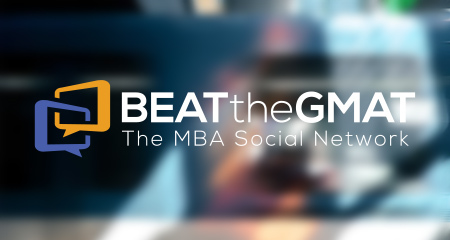 Sign up for a free trial and get access to 10+ hours of video lessons, 400+ Questions and 7+ Webinars conducted by GMAT Club’s top-rated instructors. The noun + noun modifiers are very versatile because despite having a definite structure, they don’t modify an entity in a definite position in the sentence. The noun + noun modifiers can modify the entire preceding clause, the preceding noun entity, or a noun in the middle of the sentence. The modification done by these modifiers is completely driven by the context of the sentence. This versatility of noun + noun modifiers to modify any aspect in a sentence makes them very complex and dreaded. The GMAT takers do possess some knowledge of such modifiers and their functions. However, this complex nature of noun + noun modifiers to be able to modify just about any aspect in a sentence leaves them confused as to how to identify which particular entity a noun + noun modifier is referring to in a particular sentence. Hence, they pray not to encounter these scary modifiers. In the above sentence, “a gift that was in her wish list from a very long time” is the noun + noun modifier. a gift = noun that was in her wish list from a very long time = noun modifier. Now, in this sentence, there are two equally strong contenders for the modification of this noun + noun modifier – iPhone 4S and iPad 3. Anyone of them qualifies to be in Kim’s wish list. The noun + noun modifier “a gift that…” will make sense with both the entities. Hence, in this sentence, there is ambiguity about the modification of noun + noun modifier. Hence the use of this modifier here is incorrect. In this sentence, noun + noun modifier has been replaced by relative pronoun clause. Relative pronoun “which” clearly refers to the preceding noun iPad 3, making it clear that this item was in Kim’s wish list for a very long time. We can interchange the devices to denote which article was in Kim’s wish list for long. Also, since the modification of noun + noun modifiers are completely context driven, a test taker may find it extremely difficult to identify the entity this modifier modifies in a sentence if he/she is unable to understand the intended logical meaning of the sentence. This article is aimed at doing away with all the fears and confusions related to the usage of noun + noun modifiers. 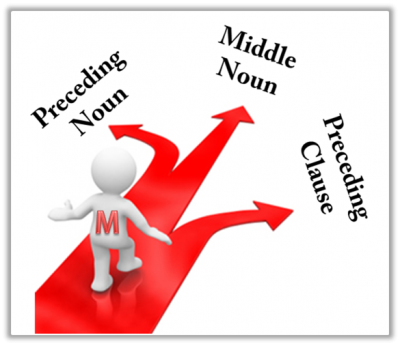 In this article, we will demonstrate how and in which scenarios, a Noun + Noun Modifier can be used to modify various entities in the preceding clause including the entire preceding clause itself. At the end of the article, we have also included a small quiz for you to check your understanding of this particular modifier. As already mentioned above, noun + noun modifiers are very versatile modifiers and can modify an entity in the sentence. This entity can be the immediate preceding noun, a noun in the middle of the preceding clause, or the entire preceding clause. The modification of noun + noun modifiers completely depends on the context of the sentence. Let’s discuss the “warm up” sentences to see how they are correct and the noun + noun modifier in each sentence is modifying which entity in the sentence and why. Noun + Noun modifier can modify the immediate preceding noun entity if the context of the sentence demands so. Sentence 3 of the “warm up” exercise falls into this category. This sentence means that James created an excellent design by using latest design tools. Then the modifier explains what kind of tool they are. They are expensive but helpful devices that are specially created for certain specific tasks. expensive but super helpful devices = noun entity developed especially for minute detailing and elaboration = noun modifier. Notice that “developed” is the verb-ed modifier here that is modifying the preceding noun entity “expensive but super helpful devices”. The noun “expensive but super helpful devices” can logically refer to the “latest graphic design tools”, because there is no other noun entity that it will make sense with. Now “design” is another noun in the sentence. However, “design” cannot be classified as “tools”. Hence, logically this modification will not make sense. Hence, per the context of the sentence, the noun + noun modifier (expensive but super helpful devices developed especially for minute detailing and elaboration) is modifying the preceding noun entity (latest graphic design tools) in this sentence because that is the only logical referent in the main clause. In order to understand the modification in this sentence, let us first understand the intended meaning of the sentence. The sentence says that The WWF has declared that global warming will create havoc among migratory birds. It will do so by changing the environment in such ways that will be harmful to their habitats. By the way, global warming is a phenomenon that most scientists agree is caused by the burning of fossil fuels by humans. In this sentence, “a phenomenon that most scientists agree is caused by human beings’ burning of fossil fuels” is the noun + noun modifier. a phenomenon = noun entity that most scientists agree is caused by human beings’ burning of fossil fuels = noun modifier. The noun modifier in this structure is a relative pronoun “that” clause. Here “that” refers to “a phenomenon”, the preceding noun. So, logically what can be referred as “a phenomenon…” in this sentence? The WWF can certainly be not classified as “a phenomenon”. So this noun is ruled out. Again, can “a phenomenon” be attributed to the action of declaring by the WWF? Certainly not because it does not make sense to say that the declaration is a phenomenon that most scientists agree is caused by a certain activity of humans. So this entity is also rejected. Can “global warming” be called “a phenomenon” that most scientists agree is caused by humans? By all means, yes. It is the phenomenon that has caused by humans’ burning of fossil fuel. Hence, per the context of the sentence, the noun + noun modifier is actually talking about the preceding noun entity “global warming” in that it is giving additional information about global warming which a phenomenon, an incident. The noun + noun modifier is referring to the immediate preceding noun in this official sentence. A noun + noun modifier can easily modify a noun entity in the middle of the preceding clause, provided the context of the sentence demands such modification. The versatility of this modifier allows it zoom into any entity of the preceding clause to modify it. Let’s understand this by examples. Sentence 2 of the “warm up” exercise falls into this category. As usual, let’s first get the meaning of this sentence. The sentence says that James created an excellent design, using latest graphic design tools. It was a work that was acknowledged and appreciated by all investors. In this sentence, “a work acknowledged and appreciated by all investors” is the noun + noun modifier. a work = noun entity acknowledged and appreciated by all investors = noun modifier (verb-ed modifier) that modifies the preceding noun. Per the context, the noun entity “a work” must refer to a logical entity. Now, the only logical entity to which “a work acknowledged…” can be logically attributed to is “a magnificent design”. This is the work that James did. Now let’s ask, is it possible for this noun + noun modifier to refer to the preceding noun “latest graphic design tools”? Logically, no it’s not. “Tools” cannot be called “a work”. Their creation can be classified as work but “tools” themselves are not work. So, per the logical context of the sentence, “a work acknowledged…” modifies a noun that appears somewhere in the middle of the preceding clause. Let’s take the first step. Let’s first understand the meaning of this sentence. The sentence says that in 1713, Pope started translating the Iliad. This work of translation took him seven years. Johnson pronounced this work the greatest translation in any language. So as identified already, “a work,,, any language” is the noun + noun modifier in this sentence. a work = noun entity that took… any language = noun modifier (relative pronoun “that” clause modifier) There are two nouns before “a work” that this modifier can refer to – “translation” and “Iliad”. Let’s first analyze the modification with “translation”. It makes absolute sense for “a work” to refer to “translation” because the translation is the work that the Pope did and this is the work that took him seven years too. Also, it is the translation only that Johnson pronounced the greatest in any language. Now let’s see if “a work” can refer to “Iliad”. Certainly not because the Pope did not take seven years to finish Iliad. He took that long to translate Iliad. Also, Johnson did not call the Iliad the greatest translation. He called Iliad’s translation, done by Pope, the greatest in any language. Hence, logically it makes sense for “a work,,, any language”, a noun + noun modifier to refer to “translation”, a noun entity somewhere in the middle of the preceding clause. Another entity that a noun + noun modifier can refer to is the entire preceding clause if the context demands such modification. In this case, the noun + noun modifier will not refer to any particular entity but to the subject and the verb of the preceding clause. Let’s see how. Sentence 2 of the “warm up” exercise falls into this classification. Let’s understand the meaning first. James created an excellent design, using latest graphic design tools. This creation of the design by using latest design tools was an experiment that many were scared to do because the results that were obtained by using these tools were not stable. As already highlighted in green, “an experiment… these tools” is the noun + noun modifier. an experiment = noun entity that may… these tools = noun modifier (relative pronoun “that” clause modifier) So let’s consider and analyze the possible entities this noun + noun modifier can refer to. This noun + noun modifier cannot refer to the immediate preceding noun because “latest graphic design tools” are no experiment. They are tools, kind of devices used for certain activities. Hence, this modification is logically impossible. What about a noun entity in the middle of the preceding clause – “design”? Well, same logic again. “Design” itself is not an experiment that many were afraid to do. Hence, this entity is rejected too. 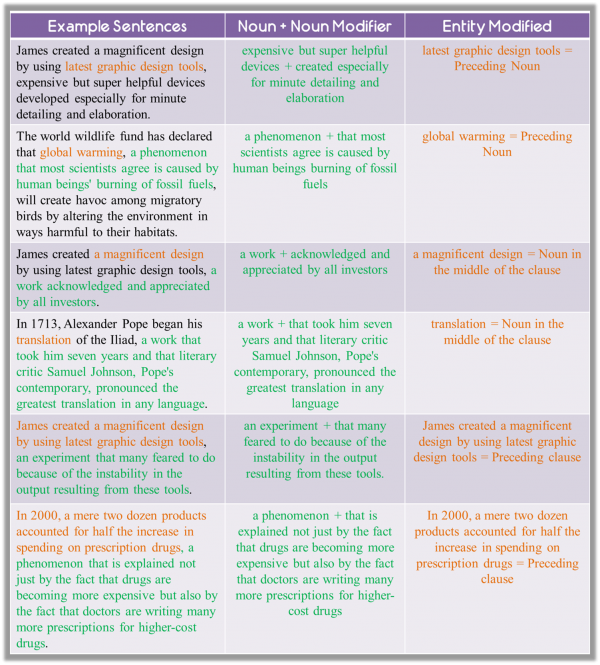 However, it does make sense to for this modifier to modify the entire preceding clause because James’ creation of the design by using the graphic design tools was an experiment because of the reason stated in the sentence. Hence, per the context of the sentence, this noun + noun modifier refers to the entire preceding clause in this sentence. drugs are becoming more expensive. doctors are prescribing expensive drugs. The green portion of the sentence is the noun + noun modifier. Is this modifier modifying the preceding noun? It cannot do so because logically “prescriptions drugs” is no phenomenon. They are products. Moreover, singular “a phenomenon” does not agree in number with plural “prescriptions drugs”. Can it modify another noun entity “half the increase in spending”? Logically it cannot because this information fails to incorporate the fact that only 24 products are responsible for this increase. This increase is phenomenal because of the fact that it has been happened because of the sale of mere 24 drugs. Hence, it makes sense for the noun + noun modifier in this sentence that to modify the entire preceding clause. This modification makes it clear why this increase is noteworthy. The noun modifiers present the reasons for this phenomenal increase in spending. Noun + Noun Modifiers can modify the preceding noun, a noun in the middle of the preceding clause, or the entire preceding clause itself. The modification of Noun + Noun Modifiers is completely Context Driven.